Ah, December… my favourite month! I'm hoping for a little festive sparkle, bright but chilly mornings, perhaps a light fluttering of snow and plenty of much-loved traditions in the run up to the big day. My husband's family run a brilliant secret santa system for presents. We are each allocated one person to buy for and a set budget. We all offer up suggestions on things we might like… it's a really simple way to avoid panic-buying random bits and pieces for each other. I do like a bit of handmade Christmas gifting too… perhaps a hand-knitted or hand-sewn item or some festively wrapped sweet treats or preserves… simple makes that will only take an afternoon but will hopefully provide the recipient with plenty of Christmas cheer. I have a few different projects in mind and I'll be sharing them on this blog in the run up to Christmas. 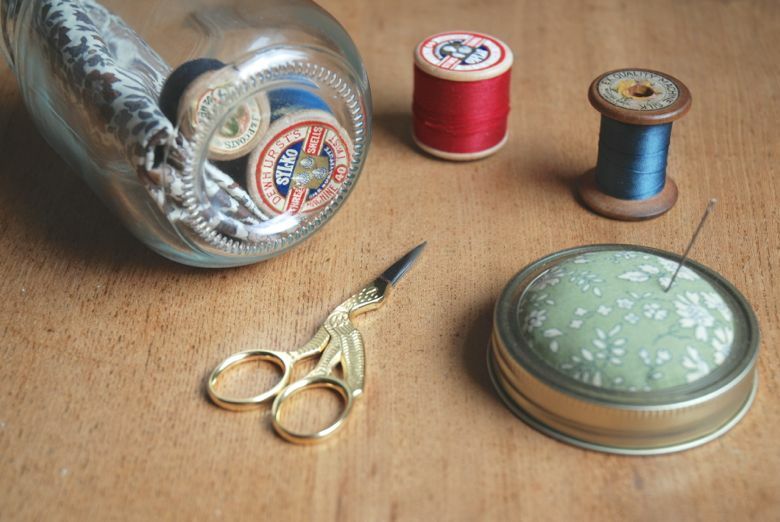 This kilner jar sewing kit and pincushion is certainly not a new idea, but I've wanted to make one for a while and think it would make a lovely gift for a sewing enthusiast. 1. 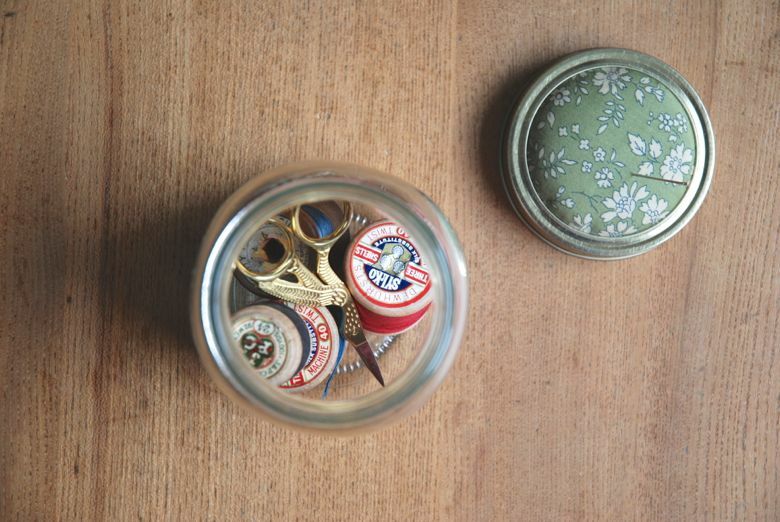 Unscrew the two-part lid from the jar and remove the metal seal disc. Set the screw part of the lid aside. Place the disc onto the cotton fabric and draw a rough circle around the outside, approximately 2 inches larger than the disc. Cut out the circle and set aside. 2. Place the same disc onto the sheet of felt and draw around it twice so you have 2 circles the same size as the disc. Cut both of these circles and set one aside. With the other, cut around it again so it is about 1/4 inch smaller than the disc. 3. 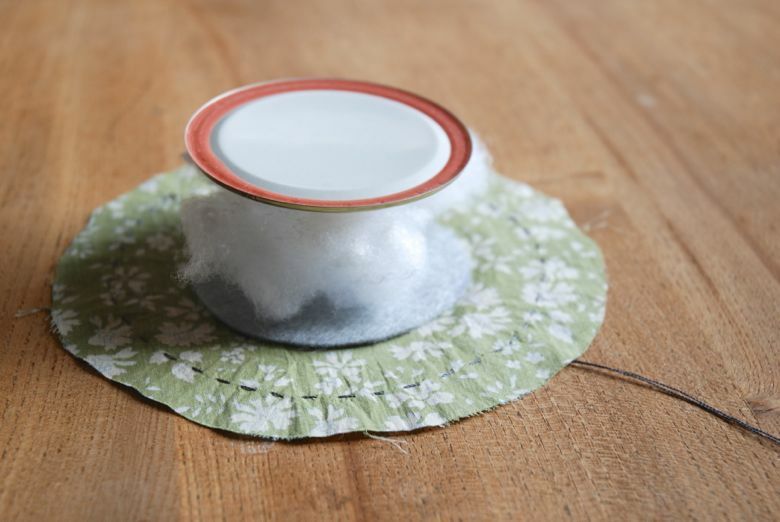 Using a small running stitch, stitch around the outside of the cotton circle approximately 1 inch from the edge. Once you reach the starting point, remove the needle but don't knot the cotton. 4. Now it's time to layer the pincushion. Lay the cotton circle onto the table and then the larger felt circle on top, followed by the toy filling and finally the metal disc. Using your finger to steady the middle of the disc, gently pull on the two cotton threads to gather. Adjust the edges until the cotton is gathered equally around the circle and then tie the two threads together in a knot and cut the excess. 5. 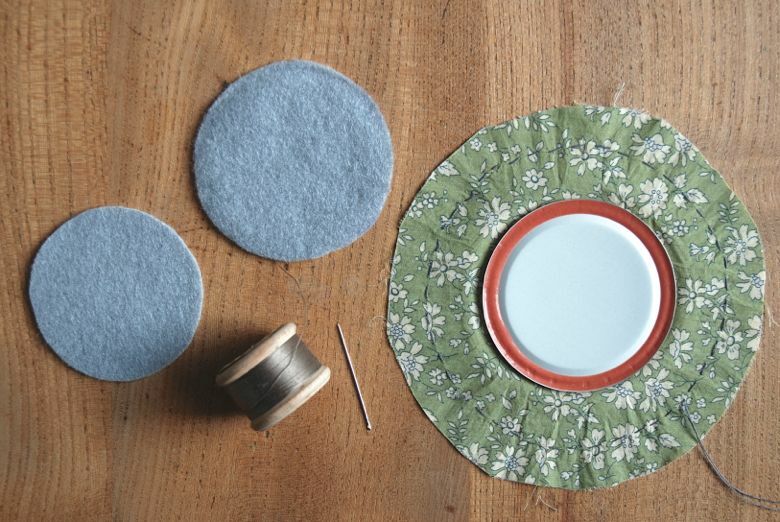 Take the smaller felt circle and lay it over the underside of the pincushion to cover the rough edges. 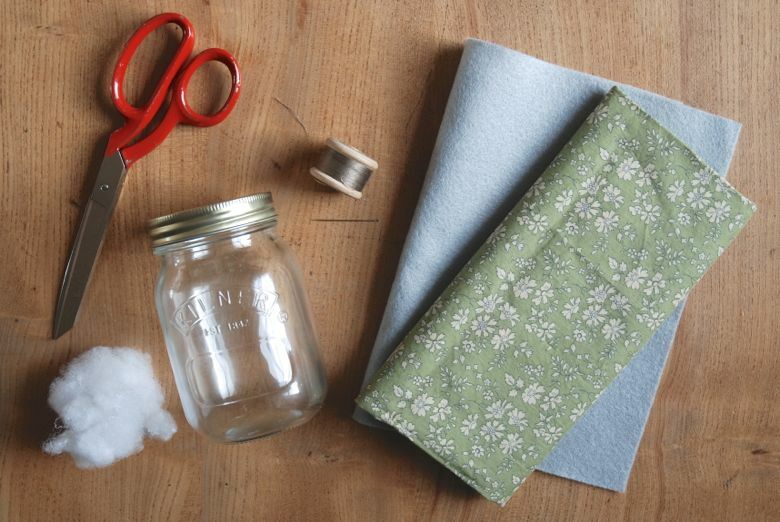 You will have a 1/4 inch gap to the edge of the cotton fabric, so that when you reattach the lid there will be room to screw it back into place. 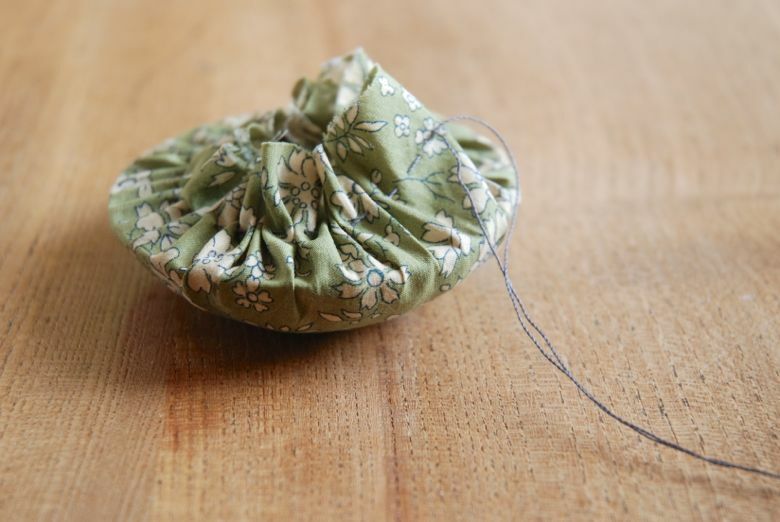 Pin it in the middle to keep it central and then stitch around the outside edge to secure it to the pincushion. 6. 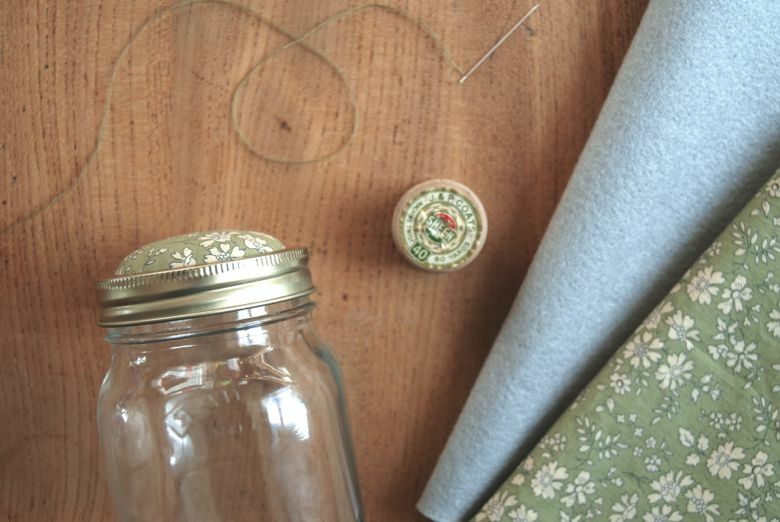 Take the screw part of the lid and run a line of glue on the underside edge (where the pincushion fabric will meet the metal). 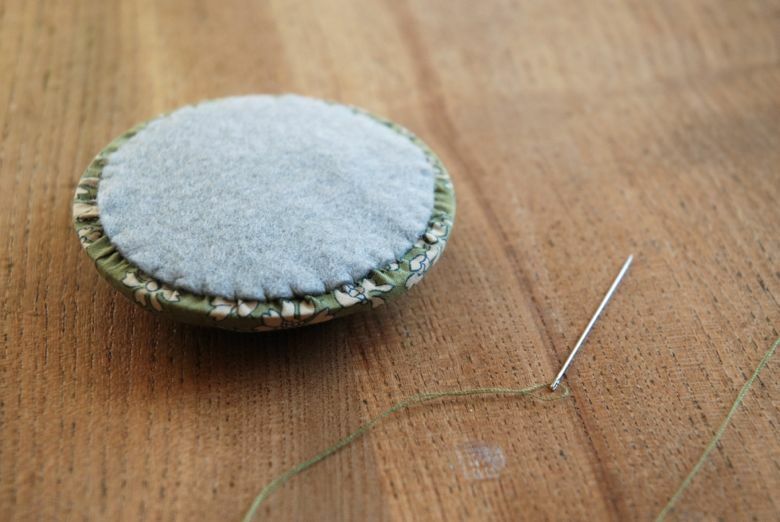 Quickly push the pincushion through and hold it in place until the glue sets against the fabric. 7. 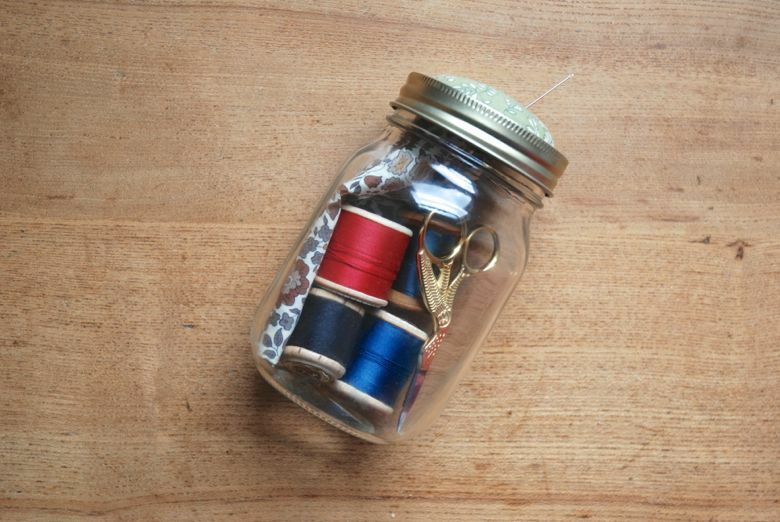 Fill your jar with sewing items and screw the lid/pincushion back into place. What a lovely gift, lucky recipient!